. إن Tolarno Hotel حريص على توفير الراحة للنزلاء، فلا يوفر الموظفون جهداً في تقديم أفضل الخدمات وضمان حسن الاستقبال. يقدم الفندق فرصة للاستمتاع بشريحة واسعة من الخدمات بما فيها: واي فاي مجاني في جميع الغرف, خدمة التنظيف يوميًا, خدمات بريدية, مكتب الاستقبال على مدار الساعة, تخزين الأمتعة . تتضمن كل غرف النزلاء وسائل الراحة والتسلية المصممة خصيصاً لضمان الراحة القصوى للضيوف. كما أن مجموعة الخدمات الواسعة الموجودة في الفندق لضمان راحتك تترك لك الكثير من الخيارات لقضاء وقتك أثناء فترة إقامتك. مهما كانت أسبابك لزيارة ملبورن، فإن Tolarno Hotel هو الخيار الأفضل لإقامة مثيرة وممتعة. لا يوجد بالفندق موقف للسيارات لكن هناك ترتيب مع موقف سيارات مغطى بالمنطقة (يقع على بعد 180 متر تقريبًا) مقابل 7 دولار في 24 ساعة مع قسيمة من تولارنوز. يجب على النزلاء استلام القسيمة من الاستقبال قبل صف السيارة. Staff is very friendly, recommend us where to park. Great location with great room and nice view. Everything is well equipped and very artistic hotel. Bar in the lobby, convenient, with 7-11 and supermarket nearby. Only - point is that there is no lift for the building and gotta carry luggage to the room. Highly recommended if travel light. The stay at Tolarno was absolutely great. The service staff were so friendly and warm and provided us with great travelling tips. Even provided me with 3 days complimentary parking at the nearby Metropol carpark (given that it was the first time staying with them). Special mention to a particular staff, Liberty, who made our stay a very enjoyable one. It is located very near to St Kilda's beach and is about 10-15min walk. The tram station to the City centre and the beach is just outside the hotel. There are also heaps of eating places and bars around. The decor of the hotel is mindblowing and it is like staying in an art gallery. The room which I stayed in is huge with high ceilings and a mini-kitchen which I use a lot to prepare simple meals. 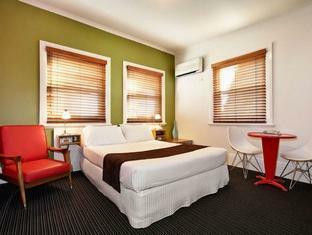 I would stay at Tolarno's again if I ever return to Melbourne. I booked a standard room for two of us and a 22 month old baby. But there wasn't even a sofa bed available at such room where I can put my baby and had a better comfort on the queen size bed with my husband. We chose to pay $60 per night for an upgrade to a suite, which includes a Queen bed and a Double bed. The room size was superb, and there was a kitchen with full appliance. The front desk was really nice. They helped us collect laundry when we went out for full day tour, and they left us very detailed notes about our airport shuttle arrangement. Location was not bad, only one minute walk to the tram station of Park Street, and some restaurants and convenience stores nearby. The interior of the hotel just looks like an art gallery, and it was really amazing. No lift as the building was built in 18xx, but the front desk lady helped us with our luggage. This is a cozy place to stay, but if you are looking for high class hotel, this might not be the choice. Small room but just right for our one night stay. Polished floorboards, great artwork throughout the hotel. We had a balcony room looking over Fitzroy St which I recommend. The only drawback was no lift, but that won't stop us returning. Staff were very helpful and accommodating. 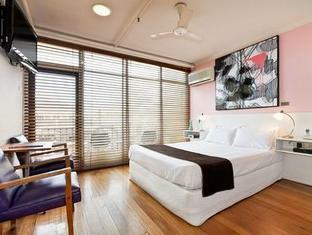 The hotel is an old art gallery and the fixtures and paintings on the wall at a unique vibe. The room was nice with all amenities provided. Very convenient location for St Kilda activities, bars, restaurants and beaches. Short tram ride to the city and close to Woolworths, post office and newsagent. The bar restaurant located below the hotel was also convenient. A nice old hotel with great decor. Staffs are definitely my biggest score here. Not to mention the cleanliness and location... definitely would recommend this hotel strongly. our stay was ok - it must be said that the value for money for a centrally located hotel was good, but it's quite run down and in need of a facelift. certainly not 4 stars. location is great though and the rooms are big, so if you are just using it as a base, then it's a pretty good option. Comfortable. 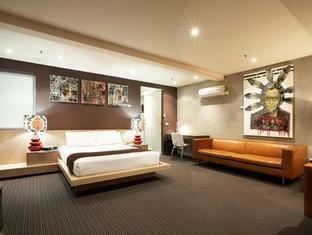 Convenient to public transport and good choice of cafes and restaurants. Onsite parking. Booked this hotel for a night's stay as we were going to a Theatre Play. It was convenient, clean and comfortable. Plenty of little cafes within easy strolling distance to choose to eat from. Would go back here again. Friendly staff. Near to drinks outlets. active night life. Have stayed many times & will return. Very funky colour scheme, artwork and furnishings in a classic old building. A very refreshing change from the usual hotel formula.